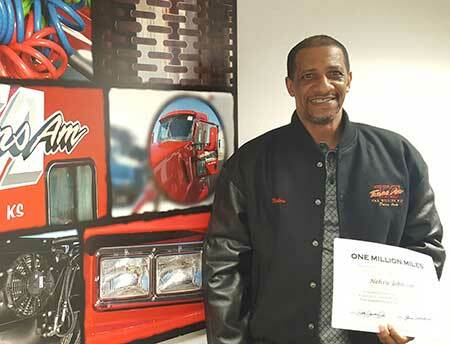 “You can’t drive a million miles by yourself,” Nehru Johnson said during his Million Mile Jacket ceremony. Some people might argue, saying driving over-the-road by yourself means you are alone. But these people do not understand the trucking industry. It is true TransAm Trucking’s company drivers and independent contractors spend a great deal of time by themselves, but they are never on their own. TransAm Trucking is a team. After his ceremony, people from every department approached Nehru to congratulate him. During these exchanges, Nehru told several people, “You are instrumental to what I do” and reiterated that his business would not be where it is today without the help of the supportive TransAm Trucking office staff. He especially singled out John Boyer, the Vice President of Planning, and Thomas Young, the Director of Training and Development. He said these men “helped me become the driver I am today.” In return, John and Thomas both thanked Nehru for choosing to contract with TransAm Trucking. There was a genuine respect on both sides of this exchange. This is because, at TransAm Trucking, we understand the importance of working together. We have a network of people available to support each driver. We trust them to haul the freight and they trust us to be there to support them when they ask. Everyone works together. Thank you, Nehru, for choosing to contract with TransAm Trucking. We appreciate all your years of service and congratulate you on your million-mile achievement. We hope to have many more miles together in the future.